ADA (Sept. 26, 2018) – Until two years ago, all Tanner Gilliam thought about was football. That was before Ada High School introduced students to planes and the forces of flight. Now, the senior dreams of attending the Air Force Academy and saving lives as an air evacuation helicopter pilot. 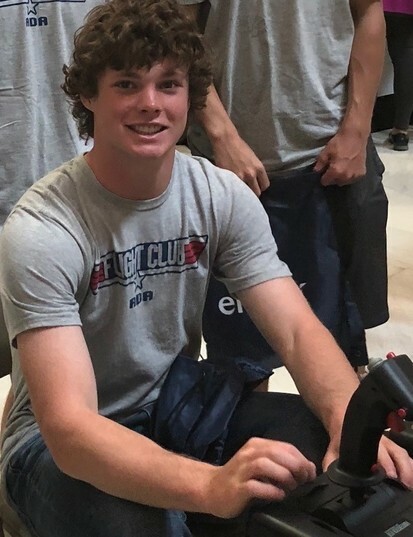 Tanner, along with other Ada students as young as Pre-K, has been bitten by the flight bug, thanks to an aviation program at Ada Public Schools that ultimately could result in juniors piloting a plane about the same time they are getting their driver’s licenses. Ada was selected as one of only 29 school districts in the country last year to beta test aviation curriculum from the Aircraft Owners Pilots Association (AOPA). The district rolled out the introductory program exclusively to ninth-graders, with plans to add advanced courses to grades 10-12 over the next three years. Tanner’s class is learning the parts of aircraft and how drones work. He’s watching an aviation lab take shape in the school’s old woodshop, complete with flight simulators and a wind tunnel. In addition to classwork, he has taken a field trip to Tinker Air Force Base in Oklahoma City, interviewed pilots at the Ada airport and quizzed a retired brigadier general on the hows and whys of his career path. 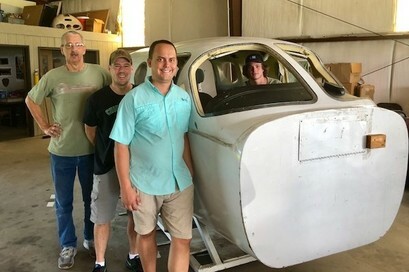 Ada Public Schools’ exploration into aviation began in 2016 when members of the local Experimental Aircraft Association (EEA) chapter approached the district about providing an airplane lesson in schools. As school administrators began to talk more to professionals at the Ada Municipal Airport about offering opportunities in science, technology, engineering and math (STEM), EEA offered to pay for district representatives to attend an aviation symposium in Seattle. Paula Kedy, Ada’s executive director of academics and instruction, was overwhelmed at first, but now, after receiving more than $100,000 in grants, she is backfilling the curriculum with aviation awareness for all grades, including “A Is for Airplane” in Pre-K. 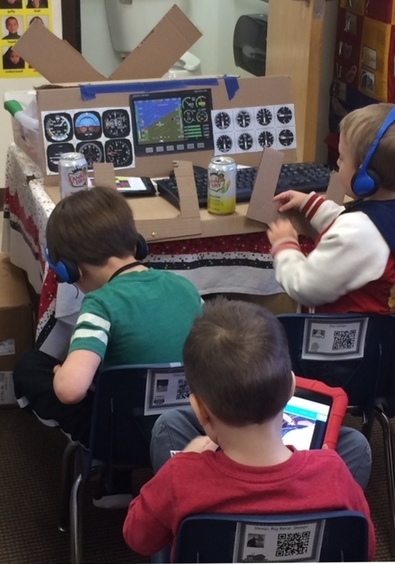 Four-year-olds manipulate a keyboard inside a “plane” made from a cardboard box and wear headphones just like aircraft pilots. By fourth grade, students are learning about the movement of the axis of airplanes, and by eighth grade, students attend an aviation career fair at the middle school. “Even if they don’t go into a career in aviation, they will at least have an awareness of the importance of it,” Kedy said. The aviation and aerospace industrty is the second-largest economic engine in Oklahoma, supporting more than 200,000 jobs with a payroll of $11.7 billion. The average annual salary in aviation and aerospace is just over $73,000, according to a report from the Oklahoma Aeronautics Commission. Kedy said the demand is so high for skilled workers that airlines have told her they are hiring aviation majors immediately out of college. The prominence of aviation in Oklahoma is particularly relevant as schools statewide get ready for Individual Career Academic Planning, or ICAP. Ada math teacher Chris Eckler, who traveled to Maryland to learn how to teach the aviation curriculum, says connecting STEM to jobs with a heroic feel has given his students a new perspective on the core curriculum. “These kids are able to see that this is something more than what they dreamed about when they were younger and that it can actually be a career. Since this is becoming more of a reality for them, they are beginning to see that there is an application to the math and sciences that they are learning throughout the day,” he said. Backing from the aviation community, including the infusion of grant money and input from the field, has been essential to the success of the program, which currently has 60 students enrolled. Some of Kedy’s partners at the airport call every week, asking how they can be in the classroom and help further the program. Supporters are even planning a gala at the airport’s new terminal to raise money for flight training scholarships, allowing promising students to get their pilot’s licenses while still in high school. Senior Iesha Jackson has always had an interest in STEM and has wanted to become a veterinarian since age 3. But after a local pilot took her to the skies as part of a free Young Eagles flight and after the first month of her aviation class at school, she is now considering engineering as a career. PHOTOS: Ada High School senior Tanner Gilliam learns on a flight simulator at Aero Oklahoma at the State Capitol. 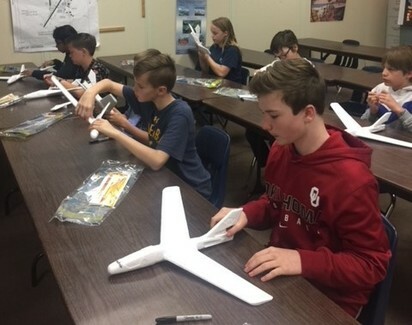 Ada sixth-graders learn the parts of an airplane at Sooner Flight Academy in Norman. 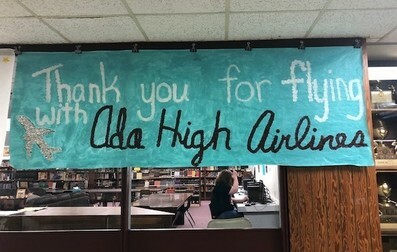 A poster at Ada High School welcomes students back to school. Local EAA members Mack Smith and Chance Plett join aviation instructor Chris Eckler in unloading a Cessna fuselage at the Ada Municipal Airport. 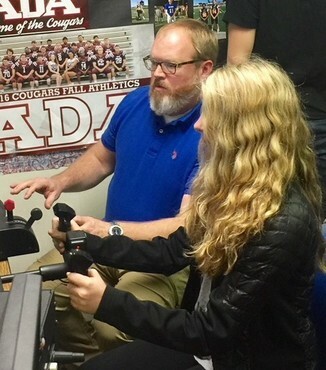 Ada Municipal Airport Manager Yancy Wood works with aviation students on a flight simulator. 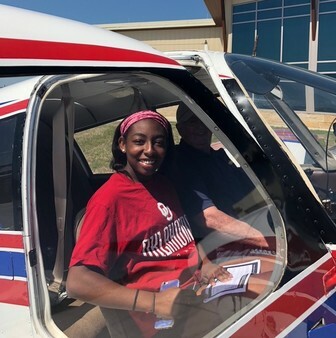 Ada High School senior Iesha Jackson takes a Young Eagle flight at Ada Municipal Airport. Photos courtesy Ada Public Schools.